The Ho Chi Minh Trail was the supply line to Viet Cong and North Vietnamese troops fighting US-backed South Vietnam during the Vietnam War. These days it's a major highway - the Ho Chi Minh Highway. 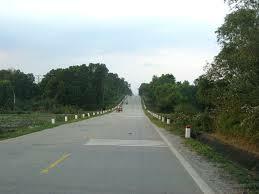 I just travelled from Hoi An to Kontum along the route, crossing mountain passes and waterfalls. We also visited the former US base at Dakto - scene of major battles during the war.